Our marble run installation was shortlisted in the prestigious Information is Beautiful awards, and we won a bronze award! We knew that The BMJ would have to do something special to mark 70 years of the NHS. We’ve examined the past and taken a hard look at how the service needs to change for the future through editorials, columns, a poll, and a special issue of our print journal. For their part, the multimedia team had considered making an interactive online data visualisation, but felt that even that wasn’t going far enough. 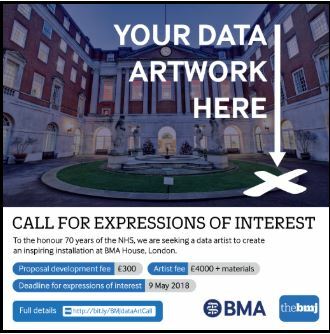 In the end, we and the BMA put our heads together, and issued a call for artists who worked with data. We wanted to create a physical representation of information about the NHS that could be installed at our headquarters in London for the anniversary. A strong and diverse set of responses were received, which led to lengthy debates at the selection panel. In the end, we chose to collaborate with a trio of artists working out of Goldsmiths: Tom Chambers and Theo Papatheodorou, experts in computational art, and founders of the Random Quark creative technology studio, working with digital artist and expert in physical computing Jesse Wolpert. 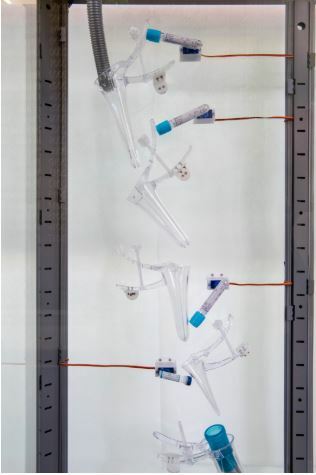 Their frankly brilliant idea was to create a set of marble runs, to present data on NHS funding, showing the kind of resources that the service uses to help us throughout our lives. The team built the installation at the Department of Computing at Goldsmiths, experimenting and iterating many times to build runs that worked the way they wanted them to. 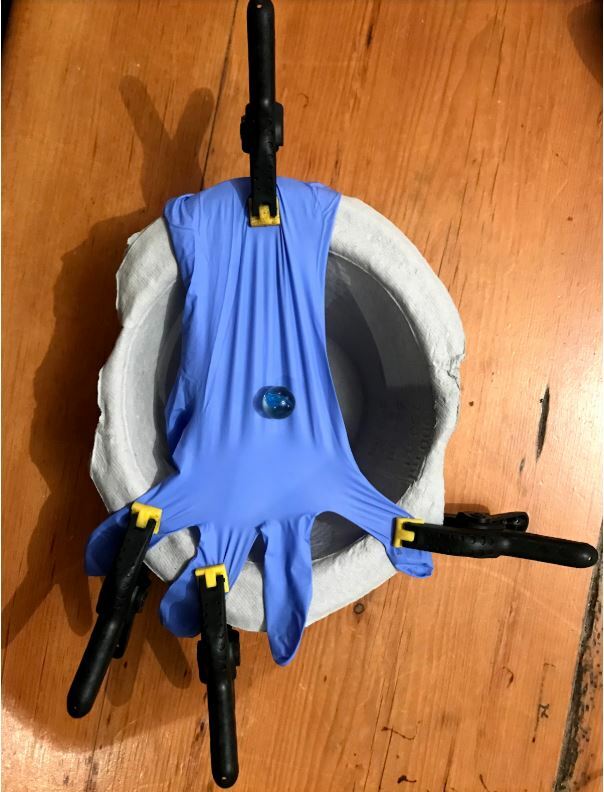 As the physics behind the way that marbles move is quite complex, this physical experimentation was needed to explore the dynamics of the piece, and allowed them to make the quite sensitive adjustments needed to the way the runs worked as the build progressed. They wanted to represent the resources used by different age groups with the length of time it took for the marbles to run through different runs. To precisely control the timings, they used custom-built, laser-cut components. Amazingly, they managed to include hundreds of medical items in runs, sourced from the internet. They used test tubes, syringes, gloves, speculums, bandages and a host of other items commonly used in health facilities. 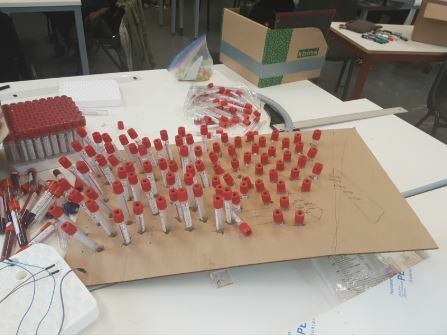 They then brought these components to life, using a range of sensors, electronic servos, lights and timers, enabling them to respond to the marbles as they pass through the runs. Unfortunately, one of the team suffered a painful injury during the construction of the run. 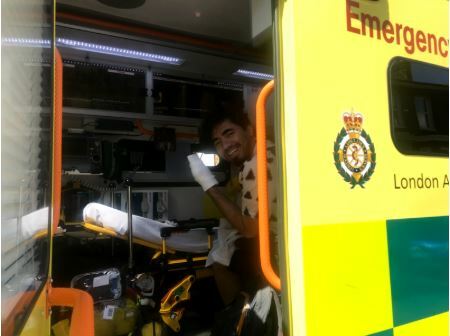 While cleaning a glue gun, Theo severed a nerve in his thumb, and the team were initially worried that this might have serious implications for the project. Fortunately, an ambulance arrived in under 20 minutes, and he was whisked off to surgery. Within four hours of the accident, he had been to theatre, and microsurgery to restore sensation in his thumb was completed. He had first-hand experience of the service that we all make use of in the UK, throughout our lives, and work was able to continue. There was a huge sense of expectation the day that the seven cabinets containing the runs arrived at BMA house, in a large red transit van. 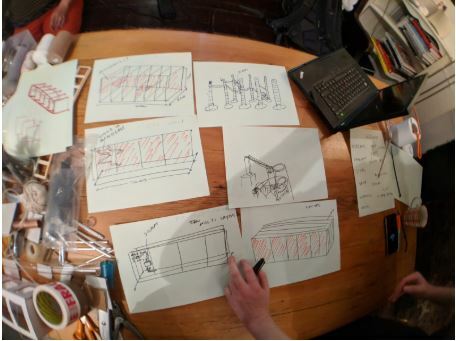 They were carefully installed, and we all held our breath as the artists replaced the parts of the runs that they had deemed too delicate to travel in the cabinets. It was quickly clear to me how much work had gone into this project. Each run had been tuned to perfection, to allow those marbles to fall at a precisely controlled speed. The intensely creative ways in which the medical components had been cajoled and persuaded to deliver their precious spherical cargo must represent many hours of thought, experimentation and play. It has been an enormous privilege to play a part in the inception of this project, although of course the lion’s share of credit should go to the artists who have literally been shedding blood (Theo) and sweat (in the sweltering heatwave in London) – and one would imagine a tear or two might also have been shed as another marble stubbornly refused to do what it was supposed to. The components are a little delicate in places, so it remains to be seen whether the run survives the test of time over the next month as it remains at BMA house. However, perhaps in a way this is indicative of the subject matter. Like the NHS, this installation is born of a spark of brilliance, and delivered with passionate care. It may occasionally creak around the edges, but we love it very much. 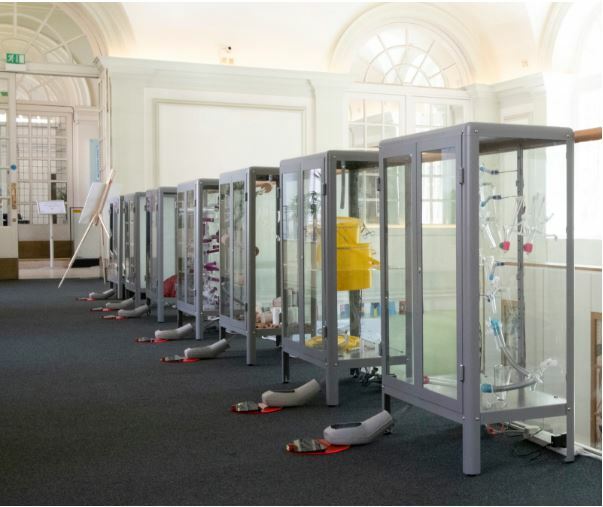 “The long run” is located above the garden cafe at BMA house, Tavistock Square, London until 3 August 2018. The building is behind access controls, but BMA members are welcome to visit between 8am and 8pm, Mondays to Fridays. The artists would like to thank: Department of Computing at Goldsmiths; Security Services at Goldsmiths; MA Computational Art students; Karen Rydings at The Surgery, Stanhope Mews West; Bill Coode at Newham University Hospital; Susan Rowe at Homerton University Hospital; John Appleby, Nuffield Trust. Will Stahl-Timmins, interactive data graphics designer, The BMJ.